LTE is standardized by the 3rd Generation Partnership Project (3GPP). It is an evolutionary advancement of existing mobile communications technologies such as GSM/EDGE and WCDMA/HSPA and is therefore an integral part of the 3GPP mobility concept. A smooth transition of an established connection between these technologies, known as handover, is essential. But LTE also defines a migration path for CDMA2000®1xRTT and CDMA2000®1xEV-DO networks, known as high-rate packet data (HRPD), which is standardized by 3GPP2. A proper interaction between these two standards towards LTE commercialization is required, as the majority of CDMA2000®/1xEV-DO operators have announced their plans to migrate to LTE within the next two years. 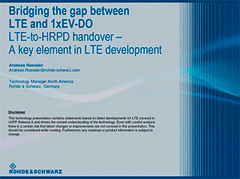 The Rohde & Schwarz webinar explains the principles of this particular handover – or handoff – scenario and how to test features on an LTE/CDMA2000®1xRTT/1xEV-DO capable device using the R&S®CMW500 LTE wideband radio communication tester.